So I paid my fee, hopped in the pool a few times to remind myself how to swim, and did a few runs to get the legs working when they came into direct contact with the pavement. 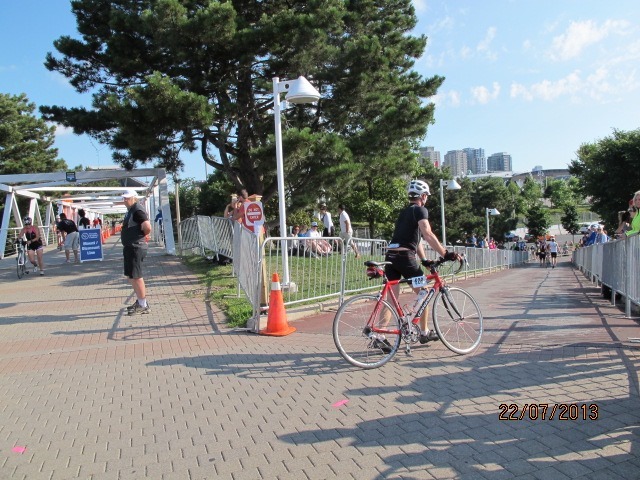 At 06:00 on July 21st I was ready to race—sort of. Now even a total optimist like myself did not expect to do well in the race. Often, those are the most fun where you have absolutely no expectations so you can just have fun. It was also a welcome distraction as we had my late father’s memorial service and interring of his ashes at 12:00. The race was much larger than last year, with upwards of 2,000 participants in the Olympic and Sprint races. 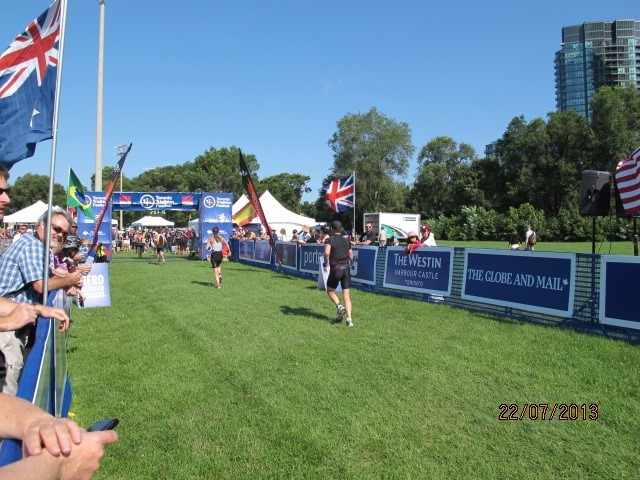 This was also the ‘Canadian National Age Group Championship’ race—which meant that the top three finishers in each age group were off to the World Championships. This meant that there were a lot of very serious athletes here, as evidenced by the expensive bikes, and the number of competitors who were wearing national team colours. 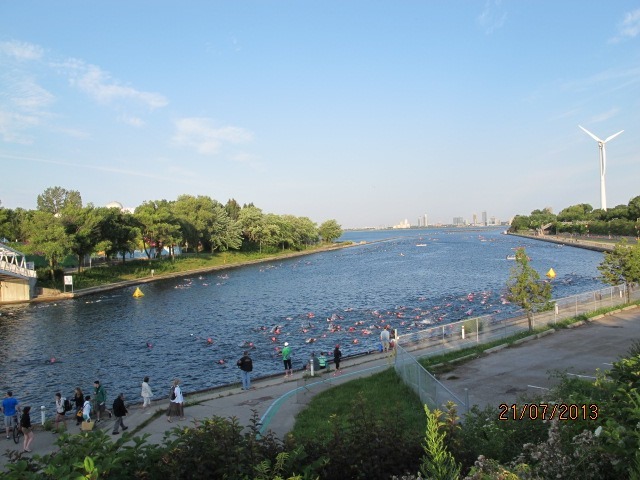 The swim was again from Ontario Place. They told us it was 21.1 degrees C so wetsuit legal. Great. I have no idea where they took the temperature because when we jumped in the water felt like 15 at best. I was seriously cold, and everyone was cursing the cold. My hands and feet went numb and I tried putting my hands in my arm pits. Doesn’t work when wearing a wet suit! Lis told me later that she saw someone taken from the water hypothermic and put in a space blanket. I’d believe it. Eventually we were off and it was the normal melange of swimmers battling for water. I was glad to be moving and soon warmed up. When we got into the sun the temperature was pleasant, but throughout the swim we’d hit these really cold patches of water which came as such a shock. It took some time for me to get into my rhythm and I did find the initial 500 m or so hard going. But eventually the body remembered how things worked – stroke/stroke/stroke/breathe/ stroke/stroke then look for the buoy/stroke/breathe/etc. Based on my four swims in the pool before the race, I estimated my swim time as about 40:00. Since I came out at 32:43 Lis wasn’t around to see me. Nice to do better than expected. I do like wearing my wetsuit as the buoyancy always helps my times. Having said that, I had a slow transition (3:43) since I couldn’t get my blasted wet suit off. Always have trouble with it … then it was running out of transition up the hill and onto the bike. 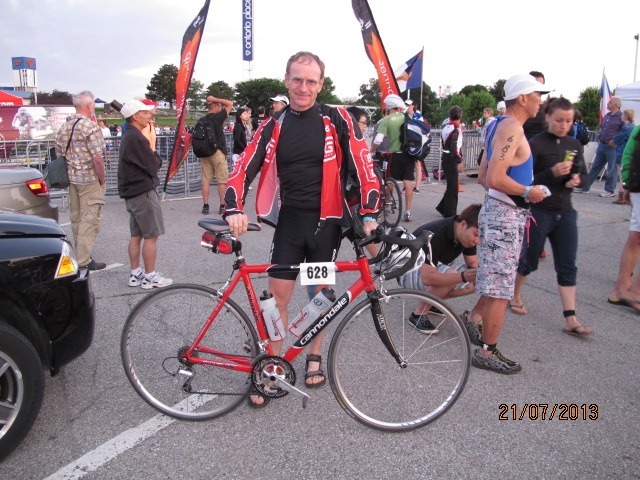 I hadn’t bothered doing much bike training as I figured I’d have some residual fitness from my recent race, although it sure felt strange being back on a 7kg road bike with skinny tyres after my 22kg+ loaded Tour Divide mountain bike rig. There was a very strong wind from east which made the going difficult, and we had the usual gaggle of riders stretched across the lanes of the Gardiner Expressway. Many travelling within the 12 m draft zone quite happily enjoying the respite from the wind. I really hate cheaters … especially when they are sucking my wind. My power meter and heart rate monitor were not working—they could not pair with my Garmin computer as there were multiple units—so I had to race without my usual data metrics. I just tried to ride about 30 km/h since I didn’t want to work too hard on the bike for the run. I was passed by a lot of people on their fancy time trial bikes (I had a $1000 road bike), especially some very fast women! I was ‘chicked’ by a 59 year old woman who blew past me on a downhill section, but I passed her soon after on an uphill. In fact, I noticed that I was passing a lot of people on the the uphill sections—probably a legacy of riding so many mountains in the Tour Divide. But come the downhills, their aero bars, disc wheels, aero helmets, etc. meant that even doing 50 km/h I was being left behind. That was OK, I was having fun. My transition was much better than the swim, but still slow at 2:17, then it was out for the run. After a kilometre or so the pain dropped to a 4/10, and by kilometre 5 it was completely gone. Go figure. I felt surprisingly good on the run as we headed west along Lake Ontario. I was only passed twice, but passed a lot of people. Unfortunately, mother nature called so I popped into a restroom—this is the first time I’ve every had to do that in a race (except for Ironman Brazil when I had passed that kidney stone half way through the marathon) so that added a couple of minutes to my time. After doing the first few km at close to 5 min/km pace, I cranked it up and tried to keep a 4:30 min/km pace for as much of the race as I could. I always find it helps my focus to identify runners ahead of me and to ‘reel them in’ one at a time. I passed 48 in the last 5 km, and none passed me. I enjoy passing someone in my age group—thereby improving my standing—but also in some ways even more someone half my age or less, which is good for my ego Soon it was across the line for my 2:41 finish. I managed a 4:40 min/km for the run (excluding my toilet break!) which was very satisfying considering the lack of running I’ve been doing. Compared to last year my placings were much worse: 28/46 in M 50-54 and 414/725. But for someone recovering from a 22 day mountain bike race it could have been a lot worse! Lis met me after the finish line and I had a few quick puffs of my asthma inhaler to prevent the asthma attack which always accompanies such a hard effort. We then headed back to transition to grab my gear and go to the memorial service. The Sprint race had started and they were not going to let us into transition to grab our gear for some time. I hadn’t factored this into the calculations … I managed to talk with the race director who agreed to let me in with the promise I would not interfere with the race. I grabbed my gear and zoomed home, with a quick shower made the cemetery with 10 minutes to spare.